What Makes a Good Corded Drill? 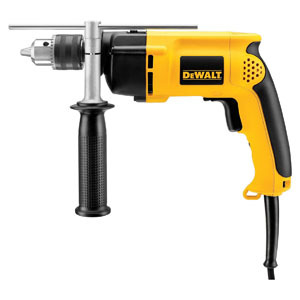 A corded drill is a powerful tool that is designed to drill holes, and drive in screws. It is one of the most popular power tools on the market giving you a wide variety of drills to choose from. Most drills offer the ability to drill holes as well as operate as a screwdriver giving you many applications for everyday use. Other drills offer various attachments which further increase its versatility. Drills come in different motor sizes and different bit sixes that allow you to drill the correct hole size or screw size that you need. One common attachment found on drills is the paddle attachment. A paddle is a metal wand that you can attach to your drill that allows you to insert the paddle into a containers and can stir up various liquids such as paint, concrete mix, drywall mud, and other materials used in home improvements and construction projects. Most drills also have extenders which allow you to reach hard to get to spots for easier drilling and more precision. These hand held tools are very affordable and much less expensive than the cordless options available on the market today. Many home users have both a corded and cordless drill in the event you need the tool and the battery is dead on the cordless version. Corded models also weigh less reducing hand fatigue when used for long periods of time. As a consumer you may wonder if you need to purchase a corded drill when the option of a cordless drill is also commonly available. Corded drills are more powerful than cordless drills and they give you the added luxury of never having to worry about a battery dying. With cordless drills you have a limited amount of time you can use the tool before having to wait for a recharge. As the battery runs down there is also a loss of power. Most corded drill come with a long and strong power cord allowing them to stretch to stretch drilling locations conveniently. Corded drills are often more compact than cordless models because they do not need the space and weight of a battery at the bottom. The heavy battery can also cause issues with balance. Corded drills can reach tight spaces and awkward angles with ease. This might include locations like behind drawers, behind doors, or inside cabinets. Having both a cordless and corded drill will give you the right tool for any application needed. After a thorough evaluation of corded drills available, followed by an extensive research process, the Black & Decker BDEDMT Matrix AC matrix system rose above its competitors. This drill is a top quality product with the power needed for both large and small drilling jobs. 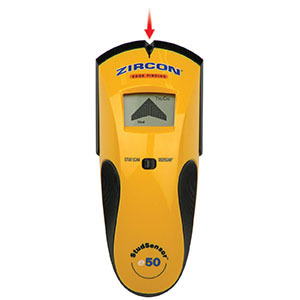 It is durable and withstood real world testing and performed at the top of its class. It also has the ability to utilize 6 different attachments which essentially creates the ability to have 7 tools in one. This is ideal for a starter drill. Corded drills are fairly inexpensive tools that can benefit most working men and women. A corded drill would easily benefit construction workers, auto mechanics, drywall installers, people who often participate in DIY projects, as well as those who do perform regular home maintenance. These corded drills can be used for many different jobs, and projects, and are equipped to aid the simplest of tasks, or the toughest of jobs from professionals to beginners, and no experience is required to use one. When selecting a drill, you should first consider how you intend to use the tool. Will you be using it for simple drilling holes and inserting screws? What kind of material will you be using? This will determine the amount of power that will be necessary with the drill. Drills come in either a ¼, 3/8 or ½ inch bit size. The 3/8th inch is the most common and will achieve the needs of most homeowners and hobbyists. For heavier jobs a ½ inch drill will give you more power and the ability to drill larger holes. The motor or amperage the drill offers will let you know how much power you will be able to get from the drill. The motor is one of, if not the most important aspect of the corded drill. This is the component that powers the tool and determines what material the drill will be able to penetrate. Power is measured by both amperage and maximum RPMs. The best corded drills are going to be equipped with 3.0 amp motors or higher to provide the most amount of power and the best efficiency. Drills with lower amperage will only be able to work with soft woods and will not have enough power for more than basic jobs. Next you will want to consider the drills weight. Hand held corded drills are tools that are going to be in constant motion so you will want your drill to be lightweight and compact to help avoid user fatigue. A compact design that is lightweight will also offer better control and greater accuracy with your drills and will be more comfortable to use for long periods of time. You will also want to check the length of the drills cord to ensure it will be long enough to reach the distances and materials you’ll want to work on. An extension cord can be used for distances beyond the cords length. Another component that is important is a quick connect system. The drill will either have a tool free bit change or will require a hex tool. If it requires a tool you will want to look for on board storage so you don’t lose the hex tool. A tool free system allows for a tool free change at the press of a button that will allow you to change bits in seconds. Clutch positions is another feature that is very useful. A multiple position clutch contours your machine to prevent overdrive and stripping of screws so you can achieve the perfect connection every time. Other useful features include variable speeds for different drilling applications and a magnetic pad which will help you keep up with screws. We began by conducting an initial search of the top drills on the market. We then studied blogs, tool websites and forums to gather information on what features were considered to be the most valuable and narrowed our search to those models that contained the features, power and durability desired by customers. Next we looked at expert advice from professional users along with tool forums and blogs, to determine the best brands and models and further narrow out list. Lastly we took into account real world applications and consulted with confirmed customers and customer review sites to gather opinions of everyday users. 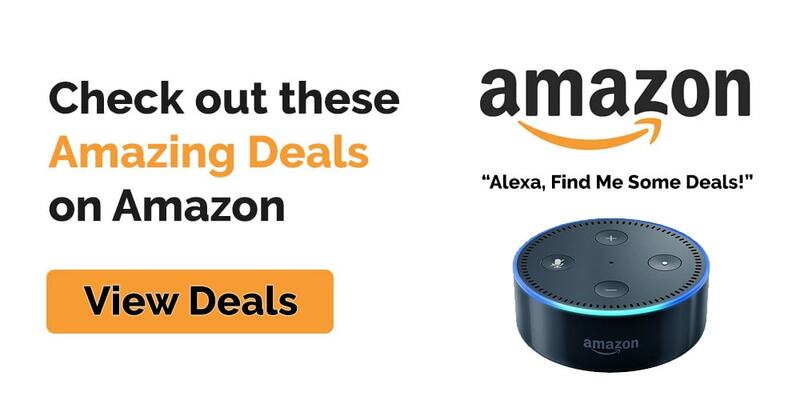 We also reviewed Amazon customer reviews before choosing our final pick. 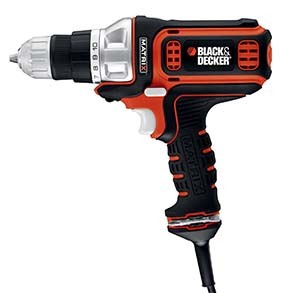 The Black & Decker BDEDMT offers a powerful 4.0-amp motor to provide enough power for a full range of attachment options. This tool is both compact and lightweight to allow its users to carry out drilling and driving tasks in confined spaces with ease. It is also easy to transport and store away taking minimal space. This drill features an 11 position clutch that provides an extra level of control to prevent stripping and overdriving screws. The handle has padded grips for better user control and comfort and to prevent user fatigue on long projects. All these features make this drill the one to beat. One unique feature of the Black & Decker BDEDMT is the matrix quick connect system which is a patented design. This system allows for a tool free change between a variety of attachments that greatly increases the versatility of the driver and provides the ability to expand your tool box in a cost effective way. The drill is compatible for attachments such as a detailed sander, jig saw, router, oscillating, impact driver, and trim saw. The drill system comes with a 2-year warranty. If you are looking for more power and versatility, then the Ridgid R7001 is a great choice. It will drill holes the fastest in its class and has a maximum RPMs of 2700. The 8Amp motor gives you enough power to drill through the toughest materials including concrete and hardened steel. There is a convenient lock for constant drilling and a nylon housing for extra durability. It comes with a 3-year warranty. Corded drills are power tools that require the use of safety procedures in order to operate safely. Below is some safety, and maintenance tips to help keep yourself and other safe while using a drill. Check to make sure drill bits are not damaged or chipped before beginning use. Keep your fingers a minimum of 3 inches away from the drill bit at all times during use. Make sure attachments are secured in place before beginning. Keep your work area clean and free of dirt and debris. Wear a face mask to keep debris and wood shavings out of you face. Never allow your cord to sit in water or other liquids. Be aware of where your cord is at all times to avoid tripping hazards. Unplug or keep the safety on when changing bits. Ensure that you have good balance when working at awkward angles. Corded drills can benefit a vast majority of people. 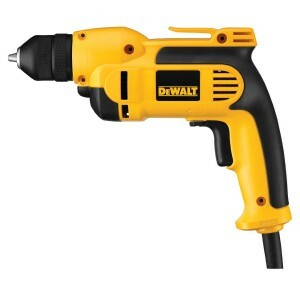 No prior knowledge or experience is required to operate a drill and the corded versions are very affordable. 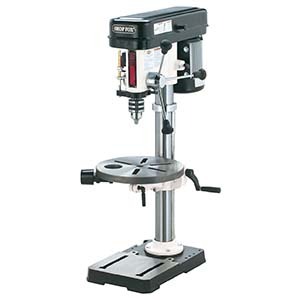 These tools are excellent for drilling hole inserting screws, stirring and mixing various liquids. They are compact and lightweight and can be stored almost anywhere. A drill is one of the most common tools owned by other homeowners and the general public.